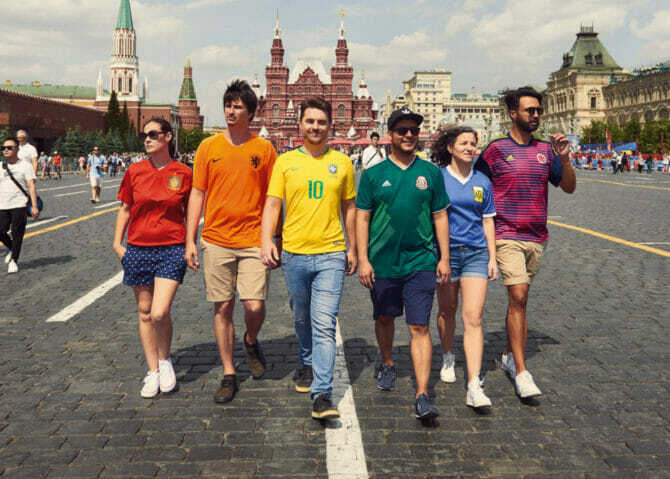 Six activists found a way to bring a message of LGBTQ acceptance and inclusivity into the heart of Russia during the World Cup. Individually, each of the participants would easily blend into the crowd, but with their powers combined, they formed a living, breathing rainbow flag. 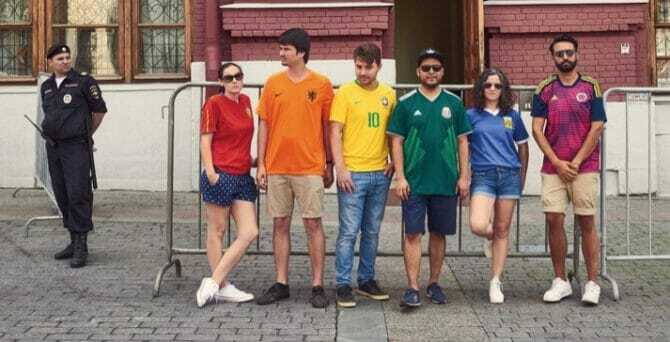 “We have taken advantage of the fact the country is hosting the World Cup at the same time as Pride Month, to denounce their behaviour and take the rainbow flag to the streets of Russia. Photos of the colorful group have been snapped all around Moscow, where broadcasting any positive queer message in public has been illegal since Russia enacted its so-called “gay propaganda law” in 2013. The group hails from all around the world — appropriate given the venue. Marta Marquez from Spain wears red, while Eric Houter, from the Netherlands, is in orange. Eloi Pierozan Junior is seen wearing Brazil’s yellow jersey, and Mexican-born Guillermo Leon, who was reportedly nervous and proud to participate, shines in green. That just leaves Argentinian Vanesa Paola Ferrario in blue and Colombian Mateo Fernandez Gomez in purple to round out this global band of rainbow superheroes. This wasn’t the only secret gay message at the World Cup in Russia. Another group set up a somewhat complicated virtual wedding tool, marketing it with augmented reality gay messages at various stadiums around the country. Love it. Subtle, subdued, yet effective. These young people are truly amazing and very brave as well as talented in their chosen sport. In the 70’s I was marching against Anita Bryant in a time when being gay was scary even in California. So Bravo and brava to them all. So great to see your post. Anita Bryant catapulted me into gay rights activism. Seriously? This was so “hidden” that I doubt anyone noticed it. Way to go…..u did it…..Cheers 2 all of us!!!???? ?